As night time falls, the sweet scent of jasmine fills the air. 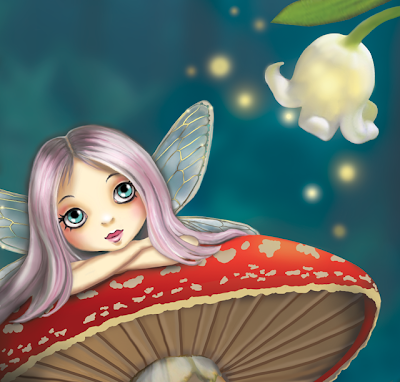 Lotti the fairy's most favourite thing to do is watching fireflies light up the flowers like flickering lamps, then follow them as they dance and twinkle their way through the forest. I am delighted to share with you this digital painting that I have been working on and off for some time. I love the fairy's sweet face as she gazes up at the fireflies. It took many layers to build up this fairy scene, just as if I were working with traditional art materials. The inspiration for this piece comes from a once a year event from mid November and December called "Firefly Magic" at the Forest of Tranquility on the Central Coast of NSW. Where you can see all the fireflies and who knows maybe some fairies too? There are endless possibilities and a great sense of freedom when working in digital; I think that is the attraction for me. I normally start with a sketch, scan it and then bring it into Photoshop. My approach with this piece was different in that I was playing around with a face in Photoshop first. The whole scene started to evolve as I went along. The last few weeks I have been kept very busy over on Life Book 2014. I feel so overjoyed to see all the wonderful art in response to my bonus lesson. They are such a warm friendly creative bunch! I am also taking a couple of workshops for myself, it seems my enthusiasm for learning and mixing with like-minded people never ceases. Just to let you know, this cute little fairy and her firefly friends are listed in my shop. You can click on my Etsy link or on the side bar under Shop.